While Donald Trump cowers in the safety of his White House residence (or his Palm Beach resort), his press secretary shows up on State-TV (aka Fox News) for a pity party with Sean Hannity. They spend much of their segment whining about how Trump is a victim of the press that just doesn’t like him no matter how awesome he is. Sarah Huckabee Sanders has the unique distinction of turning the daily White House press briefings into an extended presentation of lies and propaganda that surpasses any of her predecessors. The media participants in these charades, from across the political spectrum, openly lament that they can’t believe what comes out of her mouth. That absence of confidence is a real threat to the American system of democracy that relies on a free press. 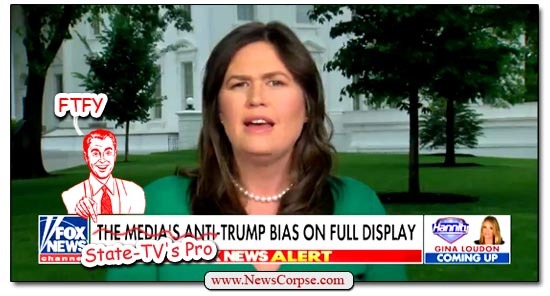 But since she represents a president who has repeatedly referred to the media in Stalinist terms as “the enemy of the people,” it would be naive to expect anything resembling honesty or integrity from her or this administration. For the record, the economy was booming for seven of the eight years Obama was president, after he guided it to recovery from the Bush recession. Trump stumbled into this expansion and immediately took credit for it. However, now that he has been at the helm for a year, the economy has rapidly cooled. It’s almost six months into 2018 and the Dow Jones is laying flat year-to date. As for the other items that Sanders regards as “good news,” remaking the judiciary is a euphemism for packing it with ultra-conservatives who will favor corporations over people; getting rid of the ObamaCare individual mandate is already resulting in higher premiums and fewer people being covered; and Trump’s foreign policy is a perverse shift from alignment with our allies to cuddling up to totalitarian foes like Vladimir Putin and Xi Xiaoping. His biggest so-called accomplishments are a scheduled meeting with North Korea’s Kim Jong Un (which may never happen, or produce the results he’s promised), and moving the U.S. embassy in Israel to Jerusalem (which has already cost more than sixty lives). First of all, Sanders has never gone one-on-one with Acosta, and she likely never will. She only encounters him in the daily briefings where she usually cuts him off without answering his questions. As for Trump being out of Acosta’s league, if that were true Trump would jump at the chance to be interviewed by someone he believes he could shred. The fact is that Trump has not had allowed an interview with anyone outside of the friendly media bunker he’s sheltered in for over a year. And he hasn’t had a solo press conference since the one he gave just after his inauguration. Trump is quite obviously afraid to face someone who might ask questions relevant to his conduct as president. It’s Trump who’s afraid to take on the challenge of an interview with Acosta or anybody else other than bootlickers like Hannity and Jeanine Pirro and the “Curvy Couch” potatoes of Fox and Friends. It’s the same reason that Trump is scared to sit for an interview with special counsel Robert Mueller. He and his handlers are afraid – with good reason – that Trump will get himself in deeper trouble by lying. Because when it comes down to it, Sanders is right when she says that Trump is out of their league. He’s way below them in every way imaginable. ← Fox News Senior Douchebag Asks: Why Would the Left Be Defending Violent Street Gangs? I think that Mr. Acosta should, very loudly and publicly accept her invitation for a one on one.